Michael Palm Toft in action against Plymouth last weekend. Man-of-the-moment Michael Palm Toft is excited by the opportunity to challenge for honours tomorrow (Friday). Palm Toft partners captain Ulrich Ostergaard in an all-Danish duo for Panthers in the Premier League Pairs at Somerset (7pm). They line up in Group A of the annual event along with Edinburgh, Ipswich, Rye House and Newcastle with only the top two sides advancing to the semi-finals. 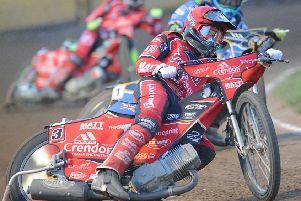 And Palm Toft will be hoping to continue the sensational form shown last weekend when following up a paid 16-point Saturday guesting haul for Scunthorpe with a top-scoring paid 14-point display for Panthers in their home defeat at the hands of Plymouth. “I was surprised to be asked, but I jumped at the chance to ride in the Pairs,” said Palm Toft. “Somerset is a pretty decent track and I’m looking forward to riding there. “It is always a very tough meeting and the line-up this year is really good. Palm Toft was one of very few Panthers riders who could hold his head up high after a fourth home loss of the season last Sunday. A 47-43 reverse at the hands of Plymouth followed hot on the heels of another league defeat against East Anglian rivals Ipswich little more than a fortnight earlier. Panthers have also slipped up on home shale against Somerset and Rye House in the League Cup competition and Palm Toft is quick to admit they can afford no more Showground setbacks as they prepare for the visit of bottom side Redcar on Sunday (4pm). He added: “On a personal level Sunday was a good day as I scored plenty of points and entertained the fans even though I can’t seem to make a start at Peterborough for some reason. “I had no problem at Workington the day before when I was guesting for Scunthorpe so it is something that needs to be sorted out. “But even though I could smile about my performance, it was very disappointing for the team to lose at home again. It is not good enough and we need to make sure it stops happening. “The track has been so inconsistent and that has an effect on some of the guys. I’m not too bothered myself whether it is deep or slick. “It is difficult for the track guys on a Sunday when the weather is warm and the sun is shining down on the track. GROUP A: EDINBURGH: (Sam Masters/Kevin Wolbert), IPSWICH: (Danny King/Rohan Tungate), RYE HOUSE: (Edward Kennett/Nikolaj Busk Jakobsen), PANTHERS: (Ulrich Ostergaard/Michael Palm Toft), NEWCASTLE: (Lewis Kerr/Steve Worrall). GROUP B: GLASGOW: (Nick Morris/Richard Lawson), SOMERSET: (Brady Kurtz/Josh Grajczonek), WORKINGTON: (Kyle Howarth/Ricky Wells), REDCAR: (Lasse Bjerre/Stuart Robson), BERWICK: (Thomas Jorgensen/Kevin Doolan).